Our Family Friendly Museum Award celebrates museums, galleries and heritage attractions that go the extra mile to provide an excellent family friendly experience. 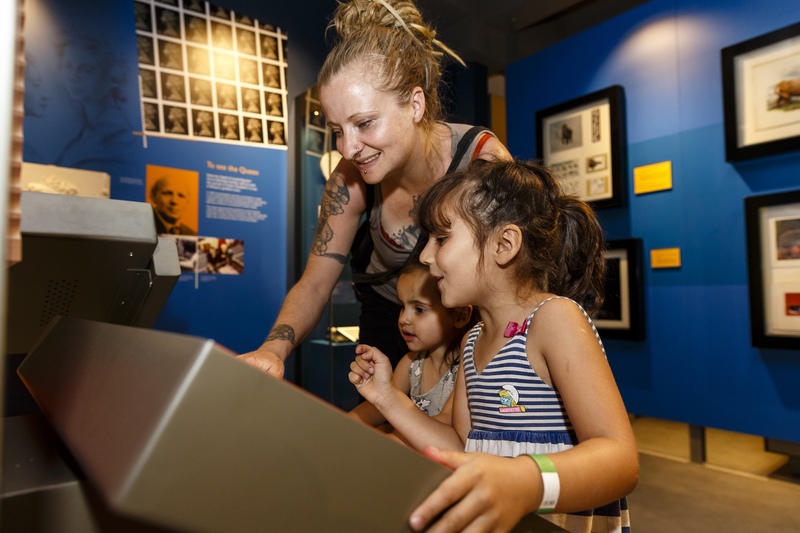 The Postal Museum in London was one of our Family Friendly Museum Award 2018 finalists. We award the prize annually to one museum, gallery, historic home or heritage site that has made outstanding efforts to welcome children and families and respond to their feedback. We welcome nominations for museums of all sizes, from national museums with teams of curators, to tiny local galleries run by volunteers. You can nominate a museum by filling in the form at the bottom of this page before noon on 31 May. If you are a museum, please take a look at our award guidance for full Terms and Conditions before you apply. We also have a range of nomination materials to help you promote nominations from your visitors. Don’t worry if you’re not sure about the category when you’re nominating – we’ll check all museums are in the right one before shortlisting. Our expert panel of museum professionals whittles our nominations down to a shortlist. Last year we received over 550 nominations from both families and museums. Undercover family judges then visit each shortlisted museum during July and August and assess them on how well they meet our Kids in Museums Manifesto. Their experiences will decide the winner for each category. Our expert panel will then pick an overall winner. Nominations for the Family Friendly Museum Award 2019 open on Monday 25 March 2019 and close at noon on Friday 31 May 2019. Our expert panel will meet in early June with the shortlist announced week commencing 17 June 2019. The Family Friendly Museum of the Year 2019 will be announced at our awards ceremony in October. Read more about Leeds City Museum and other previous winners of the Family Friendly Museum Award. If you’d like to find out more about the award, sign up to our newsletter below or contact us on: [email protected]. Please fill in the form below to nominate a museum or heritage attraction for the Family Friendly Museum Award 2019. If you are applying as a museum, please note that there is no save option, so you may wish to prepare your answers beforehand and copy and paste them into this form. Please remember to give as much detail as possible about why you think your museum is the most family friendly in the UK. Please choose family nomination if you’re a member of the public making a museum nomination. Please choose museum nomination if you’re a museum staff member or representative nominating the museum that you work in. Please use this form if you’re a member of the public nominating your favourite museum. For example you could tell us about their displays, special family events they run, the welcome you’ve received from museum staff or a great family day out you’ve had there. Please use this form if you’re nominating the museum you work or volunteer at or represent as a Trustee. Please let us know the category you are entering, if you’re not sure Kids in Museums will check all museum nominations so they are in the correct category. Please let us know whereabouts your museum is located in the UK (England, Northern Ireland, Scotland or Wales). Please describe your museum in 100 words. You could include information about the collection, the exhibitions and events it runs, the size of the staff and volunteer team or anything else you think is important about the museum. Please use no more than around 200 words. This will be the summary that the shortlisting panel read before they delve further in to your nomination. Please use it to highlight the things that you think make your museum most friendly and welcoming to families. Please tell us how your museum meets the Kids in Museums Manifesto (use about 200 words for each point). If your museum is shortlisted, please tell us who in the organisation we should contact about press and social media. Museums can send us supporting materials, such as printed family resources, visitor feedback and information on your events programme. You can put this together in any format you like – we have previously received plastic folders or USB sticks – and send it to us by email or post. Kids in Museums will send you emails about its programmes and forthcoming events. We’ll store your data securely, won’t pass it on to third parties and you can unsubscribe at any time.